This soup is a tasty one-dish meal, featuring a broiled cheesy topping, loads of vegetables and lots of noodles. 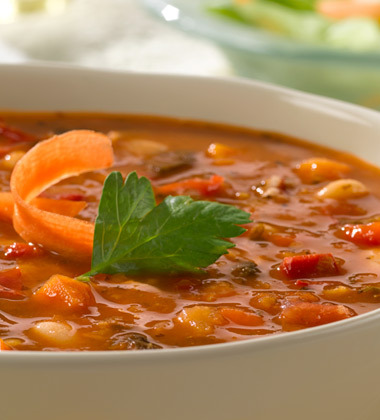 Made with carrots, tomatoes, Great Northern beans and red lentils, this hearty home-style soup is slow-simmered with aromatic herbs and a dash of balsamic vinegar for a sweet, savoury flavour. 1. Heat oil in large rondeau over medium heat. Cook eggplant and mushrooms, garlic, oregano, salt and pepper for about 8 minutes or until starting to brown. Stir in zucchini and peppers. Cook for about 8 minutes or until vegetables are softened. 2. Meanwhile, in large stock pot of boiling salted water, cook noodles for 8 to 10 minutes or until al dente. Drain. 3. In stock pot, heat soup and water over medium heat; simmer for 2 minutes. Stir in eggplant mixture, noodles and spinach. Simmer for about 10 minutes or until spinach wilts and vegetables are tender. 4. 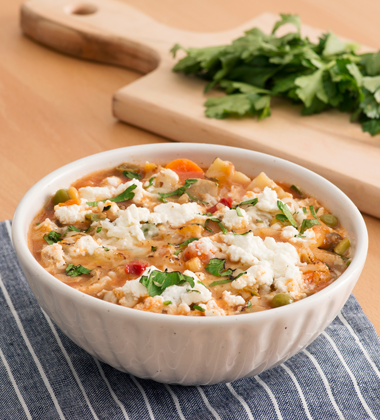 Divide soup among 12 individual soup crocks, adding 1 cup (250 mL) soup for each serving. Keep warm for service. Top each serving with 2 tbsp (30 mL) mozzarella, 1 tbsp (15 mL) Parmesan and 2 tbsp (30 mL) ricotta. Broil for about 2 minutes or until cheese is golden brown and bubbling. Sprinkle with 1/4 tsp (1 mL) parsley before serving.